The Déboulerait Performance at COLAB 2010 (18-20 May 2010) features performer Hector Lee and He Jingyin (Precursor). The piece features the Conway’s Game of Life as an instrument and focuses on the ability of its play during the piece. Déboulerait which consists of a sequential track of events, guides the performers in their improvisation by sending visuals to the performers’ instruments. The role of Conway’s Game of Life as an instrument in Déboulerait, is programmed in Chuck, an open-source music programming software. The motivation drives towards the discovery and exploration of an organic mathematical model, and using its rules and algorithm as a basis of an instrument. 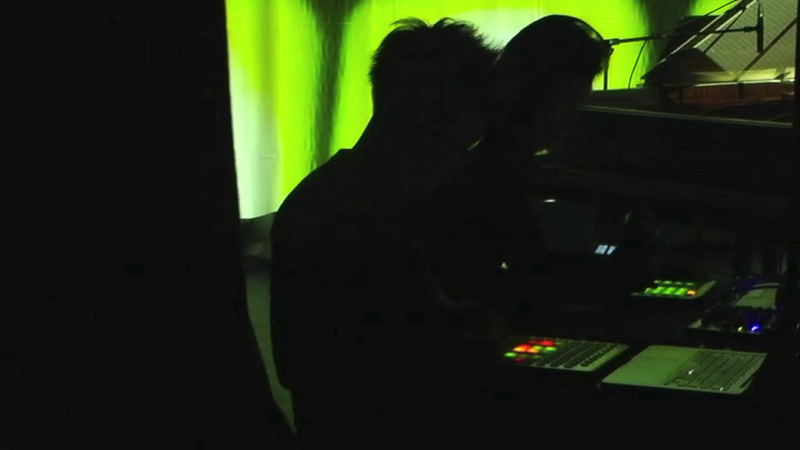 While in most electronic performances, the audience do not get to see what is happening on the screens and on the controllers of the performers, Déboulerait features a video which streams the activity of the performers on their instruments on a projection that increases the aesthetics of the performance.